forms and small to medium cell size. In environments with high nutrient availability and low flows, filamentous algae with medium to large cells that form high biomass mats will be most abundant. In locations with moderate to unstable flood conditions and variable nutrient supply, taxa that colonize denuded habitats, like diatoms, will dominate. 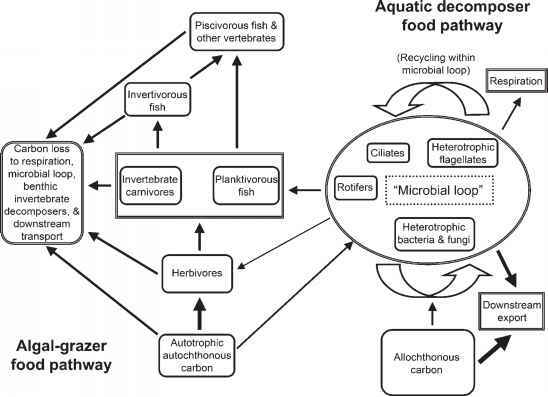 Grazers are an important factor controlling periphyton biomass and composition in locations with stable flow, primarily because larger and more effective grazers such as caddis flies and snails prefer habitats with slow current. Where the frequency of flooding is higher, mayflies dominate but appear less able to control periphyton.